Bravo Brother Dan... We continue to bowhunt with the bangsticks going off. I applaud you. Great job. Congrats again. 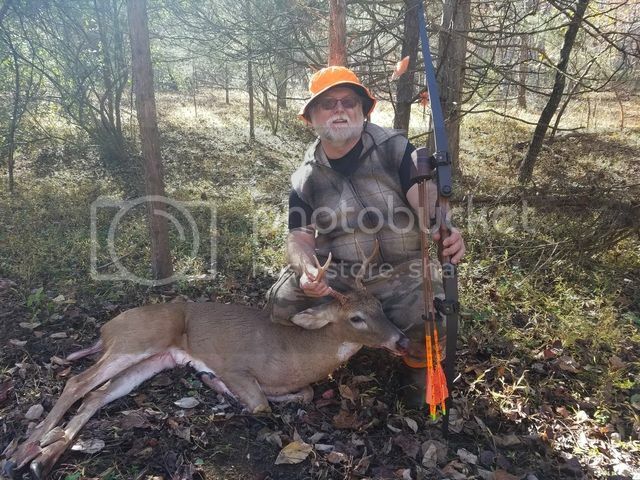 Nice one Bill, you're a buck killer for sure. Congrats. This morning the "chase phase" of the rut finally put this buck in my lap. It was the coldest morning, and the last day of my 11 day vacation. I spent the first four days of vacation hunting at my camp in Pennsylvania. No shot opportunities up there, but the bucks were cruising. When I came home, I saw numerous bucks, and passed on shot opportunities on several small bucks and little does. Yesterday (Saturday) I saw five different bucks. The last being a very big buck presenting a straight down shot opportunity right at dark. I took the shot. The buck ran 30 yards and stopped. I could barely see him, but through my binoculars I could see he was looking at me. He stomped his foot and then actually came closer. He stomped his foot, then simply vanished. I got down and looked for my arrow, assuming I'd missed. 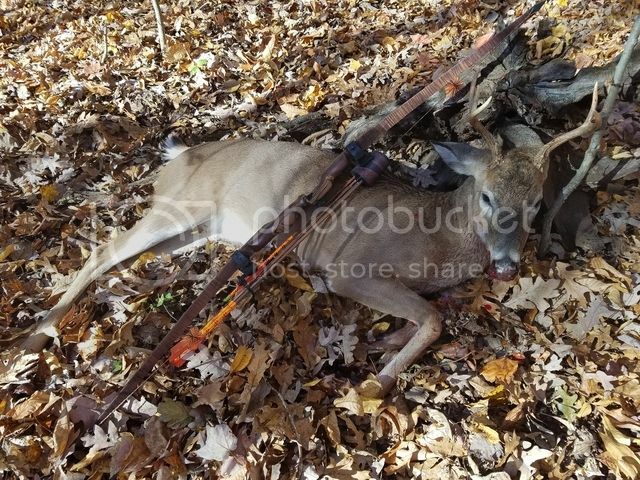 It turns out my arrow was laying 20 yards away along the path the buck had taken. it had a small amount of blood and hair on it. I went to where the buck had stood and I found small pools of blood each place the buck stood. I backed out and decided to hunt the same area this morning, then search after hunting a few hours. This morning started quickly with a small doe and a three pointer walking by at less than ten yards. All was quiet for about two hours. My daughter text me asking if I'd found the buck from last night. I told her I was getting ready to start searching. Just then a doe ran by. She had that look I'd seen the day before. I stood up and looked in the direction from which she'd come. Sure enough, this buck was trotting my way. As he passed by at 17 yards, I mouth grunted loudly and he slammed on the brakes. I was already starting my draw as he looked up at me. The arrow was on the mark and he only made it 50 yards. I immediately got down and began looking for the buck from last night. As I expected, I found about three more spots of blood, then nothing. The way he acted following the shot makes me suspect I hit him along his shoulder, just missing his chest cavity. It's very disappointing, but this guy made my day a little better. Thanks Tom. I hope you are doing well, and getting to enjoy the outdoors as much as possible. Congrats again Bill! This weekend really had the bucks moving well. 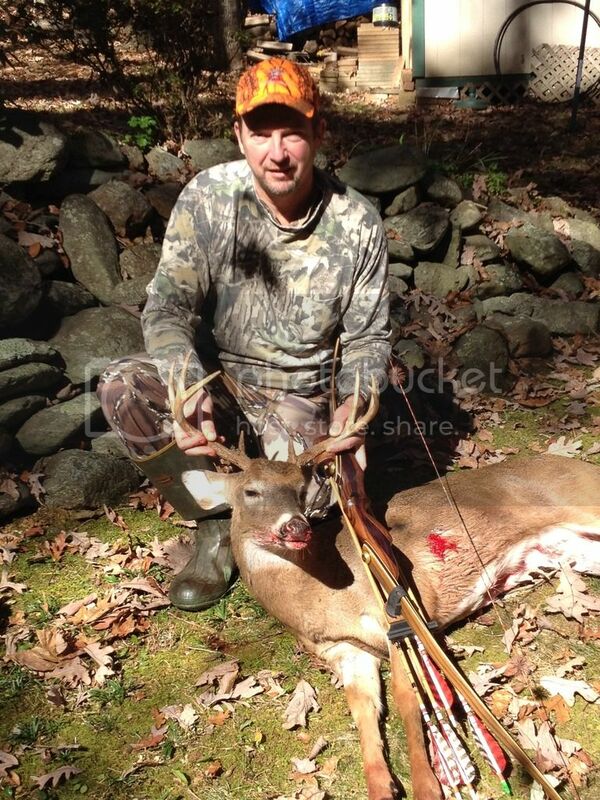 Man you are getting it done.Its good to see the Gang doing well.Congrats again on a fine kill. Kind of quiet out there recently, still trying to get things done. Nice going guys, haven't been on in a while. 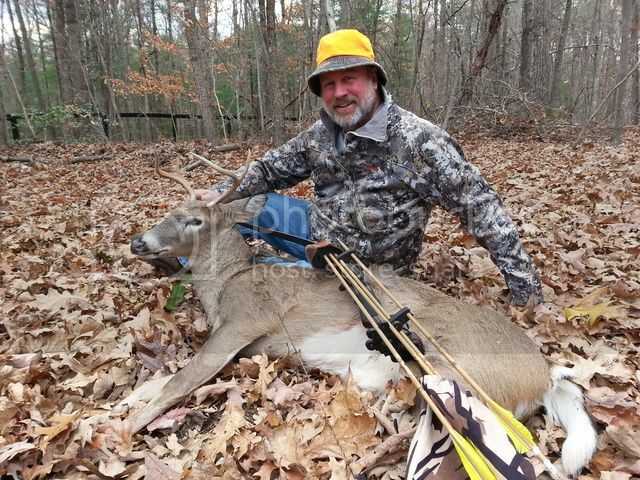 The trad hunting season for me is over, couple of weeks ago I finally had an opportunity at 15 yards on a decent 4 pt with my selfbow, and I embarrassingly shot over his back, it was a thrill, but now the deer are in the fields at our farm so I'm putting up the bow and gonna put meat in the freezer.